Throughout the course of this project, there has been the occasional film that I remembered fondly from my childhood. I wasn’t nervous at the prospect of watching any of them again; while many things I liked as a kid turned out to be terrible, it stands to reason that it’s probably pretty good if it got included in this fancy box set. But of the films I’d seen before, there were none I was more curious to see than Willy Wonka and the Chocolate Factory. I loved this film as a kid. It wasn’t in the every-single-day rotation, but we watched it pretty frequently. I figured I’d seen it recently, since I saw it so many times growing up, but upon reflection, I probably haven’t watched it since I was in high school at the absolute oldest. Looking at this with fresh, much more grown-up eyes, I was delighted to see how it’s changed. Or rather, how it’s stayed the same, and I’ve changed around it. Based on the book by Roald Dahl, the story, as we all know, follows Charlie Bucket and his trip to the Willy Wonka Chocolate Factory with his Grandpa Joe. Charlie, having found one of only five Golden Tickets distributed apparently randomly across the globe, won a personal tour of the legendarily closed-off factory from Mr. Wonka himself. As the remarkably creepy old man says at the beginning, “Nobody ever goes in. And nobody ever comes out.” After that, it’s various fun and hijinks and thinly-veiled morality tales. Wouldn’t you know it, it seems like the rest of the people who found golden tickets are maybe not all the best people they could be. When I was a kid, this movie was a lot bigger. Most particularly, the Chocolate Room (the big room where everything is edible and the chocolate river flows) was much smaller when I watched the movie again for this project. I never knew it had a ceiling, before. I mean, it must have, but in my childhood memory it went on forever in almost every direction. Now, it’s a rather large room, but it’s finite. Which is a bit sad, but understandable. The room after that, where everything is being mixed and where the everlasting gobstoppers are, is also much smaller and kind of worrisome. It was zany when I was eight, now I’m kind of concerned about the health codes being so cheerfully disregarded. The best thing about this movie, though, is how much funnier it is now. It’s funny to a kid because Gene Wilder says strange things, but more importantly, because there’s all this candy to ogle at, you’re plenty involved without understanding it all or even noticing that you’re not understanding it at all. This time, there were some great jokes I’d never heard before, even if I’d seen the characters say the words when I was a kid. 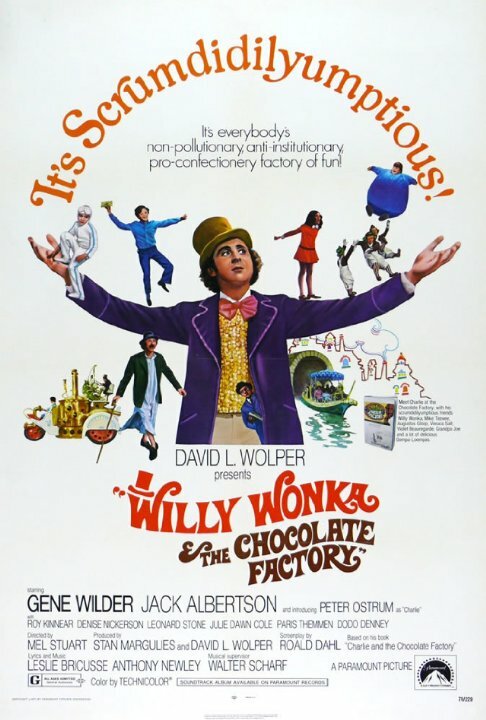 Offhand, I particularly like the sequence–which has nothing to do with the rest of the movie– that illustrates how insane everyone’s gone over Wonka bars. There’s a hostage situation, a psychiatrist, and a really great bit with a snarky computer, among others. None of the characters come back, they’re never referenced again; they just show up briefly in these little vignettes to cumulatively make a point and include some great throwaway jokes. What would a computer do with a lifetime supply of chocolate, anyway? Some things are exactly the same, though, including the nightmare boat ride– raise your hand if you were always way more bothered by the giant millipede on the person’s face than the chicken getting beheaded– and the sheer, complete, utter awesomeness of Gene Wilder. He is so completely delightful and not entirely rational, in a completely delightfully unnerving way. I was surprised to discover that a lot of his strangeness comes from taking things completely seriously, particularly when the other so-called adults assume he’s joking. You’ve seen this movie, probably, but watch it again. It’s great. Show your kids or young relatives or your friends’ kids. Watch ig again yourself if you haven’t in a while. You’ll be delighted to see how you– and it– have aged. Also, The kid who played Charlie is one of very few examples of quietly-handled child stardom. Charlie is the only role he ever played. He went on to become a Vet in upstate NY.